If your dream visit to NYC involves kicking off your shoes at an island-themed hotel while sipping margs and relaxing to the dulcet tones of Jimmy Buffett's beach tunes after a long day of sightseeing, you'll be happy to know a Parrothead paradise is currently in the works in Manhattan. That's right, the Big Apple may soon be getting its very own 29-story Maragaritaville hotel right in Times Square. Following news earlier this year that Jimmy Buffett will soon cut the ribbon on the first-ever Margaritaville-themed retirement community in Florida, it appears the soft-rocker behind "Cheeseburger In Paradise" and dozens of other hits is also planning to add another location to his his portfolio of Margaritaville Resorts, and the first ever in NYC. That's at least according to a report from The Real Deal, which claims there's a deal in "late-stage negotiations" to get the ball rolling on a sprawling Margaritaville hotel and restaurant on the south end of Times Square. 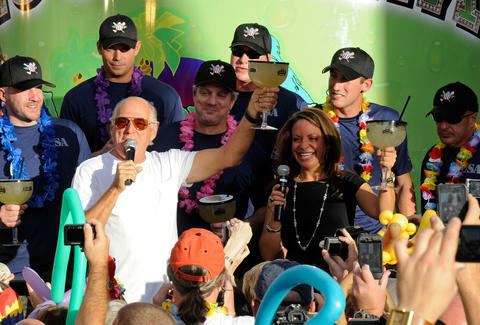 As of Wednesday, Margaritaville representatives we reached out to declined to confirm or elaborate on the plans. Since the deal isn't official yet, details are scarce. However, the location in question is the same site once considered for a new Dream Hotel that was envisioned to be 29 stories, boast 243 rooms, and clock in at around 120,000 square feet. Though, if this development ends up anything like the existing Margaritaville resorts in Florida, Mississippi, Tennessee, Louisiana, and the Cayman Islands, it could very well offer amenities like an on-site spa, a performance venue, beach-themed bars, and even a pool. One thing it will most certainly have: a gift shop where you can stock up on flowy Hawaiian shirts, Margaritaville-branded beer coozies, and the island crooner's entire album catalog. And while there's no telling when exactly the hotel and restaurant will open or what a room might cost, Parrotheads do have a good reason to hit the Big Apple next year, since the Buffett-inspired musical "Escape to Margaritaville" hits Broadway in February.